Something I meant to do a while ago, but I’m doing it now… I’ve uploaded the list of 100 ways we suggested to save the city. The list ranges from the entirely possible to completely imagined, but each one might just make this city a better place, or at least make you feel a little bit better about this city. There’s a different background colour for each of the 100 ideas, each of which was taken from a Google Map of Windsor. The colour didn’t show up so well in our projection, but it was there. We’ll also upload the little Max patch we wrote to do the performance … it’s quite easy to use, but maybe would eventually be better to be something written in Processing? Download the PDF for your enjoyment. As part of FAM Fest 09, we did a projection performance on the roof of Metro Cleaners accessed from Empire Lounge in downtown Windsor. 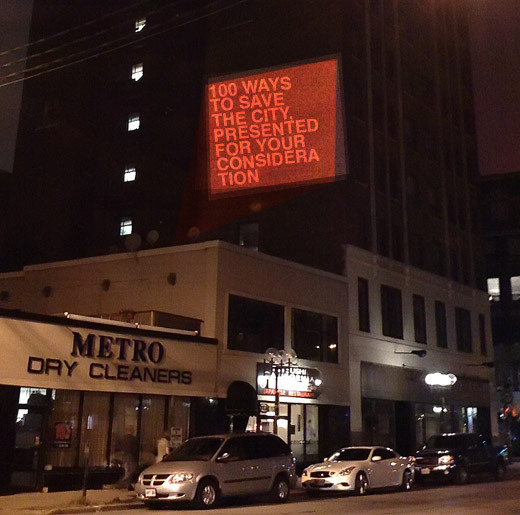 For about an hour and a half, we presented our 100 Ways to Save the City and then asked for ideas from the folks on the ground, at Phog, and on the Twitterverse. After the jump, there’s 160-something photos from all the ideas that were projected on Saturday night. Last night out a window in the county, the new projector at night. Today, finishing our list of 100 ways to save the city. It’s going to run as a presentation in Keynote, the easiest failsafe solution. Though, we might try to open it up on Twitter somehow later tonight. And, speaking of tonight, the weather is looking good. No rain!!!! We’ll be projecting across from Phog, look up above Empire Lounge and you’ll see us. Tonight is marks Day 2 of FAM Fest, hope to see you out and about. Saw a good deal on FutureShop’s website, thanks to Mike, and had to place the order. While this projector is still nowhere near bright enough for Cross-Border Communication, I couldn’t pass up a 2800 lumens projector on sale for half price. It’ll debut tomorrow night at our projection performance for FAM Fest. We met last night and started our list of 100 Ways to Save the City for our projection on Saturday night as part of FAM Fest. We’re also spent some time putting together a rough schedule for 2009 Micro-Residencies, which will likely start in November. If you’ve thought about applying, but haven’t yet, now would be a great time to put forward an idea! Projection Site for Another Project? I’ve been meaning to take a look at this location for a potential projection project that we’re looking into for Harvesting the F.A.M. The wall is dark brick, but we need to work out the logistics of projecting onto such a surface anyways for another project we’re working towards. What exactly we’ll be projecting is still up the air, but we plan to be on the roof of Empire Lounge for an hour or so on one of the nights of the F.A.M. Fest. We’ll keep you posted.